There is a subject I skirt. Sure, if you talk to me regularly you’ve likely heard me mention it, but I surely haven’t brought it up at any length publicly yet. The fallout of Brooklyn’s being taken from us for J has been stated. He has suffered regression, a major surge of anxiety into his life and a general feeling of instability that leaves him clingy and uncertain. He works, every day, to regain ground that he lost but there are a lot of things that just are completely wrecked for him at the moment. We can’t ignore that, we can’t escape that and we work to rectify that. What others stole we will restore, I have deep faith in that. Meanwhile, I ignore the destruction wrought on myself. Every day I beat myself up for getting on that plane in June and bringing Brooklyn back to Ohio. I had misgivings when I dropped her off, but I trusted. Should I have trusted? I do not feel I should have no, though I feel the person I trusted possibly was as mentally knocked about in this situation as I have been if not more so. I shook as I stood there in the facility letting her go and detailing her very specific care to the staff. Everything felt wrong, and every day I have to face the regret that came with not listening to my gut and misplacing my trust instead. I let my son get hurt. I know, logic screams that is not the case, but my brain doesn’t always function well with logic. The wound was made. It’s going to be a very, very long time to heal. I feel hurt, broken, unworthy. I feel like a failure, a person who breaks promises, a person whose earnest nature was taken advantage of and whose words were manipulated for the gain of others. I feel used, abused and tossed aside. I feel lied to and cheated. I feel like I have an open sore that will never heal over. Everyday I fight crippling anxiety and depression lately. I don’t want to function. Frankly, I want to stay in my bed and hide from everything. It hurts to go out in the world. It hurts to do bare basic necessities. The only reason I put one foot in front of the other is J. He’s brave enough to keep going and keep shining and I cannot completely fail him again. Our visit to APAW for our interview with them was a light in the darkness. I am very upfront with my own disability and they know it is there. They understand psychiatric disabilities. They will not put me in a position to use my illness against myself. This I can see by what they have done. Every day I still hurt though. Every day things still feel wrong. Every day people still sit back and blame me for their choices and actions, like my family actually did something wrong. I know we gave Brooklyn the finest care and the utmost love. I know she had a happy, safe and adoring home with us. I know we followed the rules to a T because my mental illness would accept little else. Still, every day I have to live with the doubt that was planted. And I will never get resolution. A death? The story is ended. There is no ending here, there is just an open and gaping void with no rhyme or reason. Nothing ever had to be this way and somehow, we will move forward thanks to great people and a great community who actually believe in us. Remember, if it seems too good to be true it nearly always is. The changing of agencies brings with it a lot of new questions, I imagine. Here is an idea of why we chose APAW, what happens next and what we are hoping for. Why did you choose APAW? There’s a lot of agencies out there! When it became clear that a change of agencies was needed everything became even more overwhelming than it was before. There are a lot of places that advertise placing service dogs with children with autism, but deeper searching revealed that either they did not place with children so young as J or that they had serious marks against their reputations. I spoke with one agency that with one email sent up all the red flags that had us turning away from the agency we were already with. There was no way we were going to go through that again! Other agencies looked like they might work but multi-year waits or distance were big drawbacks, drawbacks I wasn’t certain we could weather at this point. I spoke to not only APAW itself, but to people who worked with them, an outside agency that we have worked with since we finished fundraising with the other organization and looked through the background of the staff. It was not a hasty, emotion-made decision. Everyone I spoke with was positive, honest and transparent. Then, we had a several hour interview with the founder of APAW who proved to be an absolute delight. She treated both myself and J with patience, humor, respect and clear personal interest. We were not numbers, J was a person in her eyes. She paid mind to how he interacted with each dog she introduced him to, answered my questions honestly and clearly and gave a great insight into the organization she runs. I knew the moment we walked out of the interview this was who I wanted to work with and who would likely help J best. What happens next? Will it work like before? This journey is likely to look a lot different from before. This is one of the things that appealed to me the most. This go, we will be able to hopefully volunteer within the organization as well as work towards J’s dog. Now, the fundraising for the dog was complete two years ago. That money is now with APAW to pay for the placement of J’s dog. However, rather than wait 12-24 months until a dog is fully trained to bring the dog into our home, we are hoping to bring a younger dog in training to live with us instead. This dog could be as young as a just out of their mother’s care puppy or slightly older. Seems weird, right? Why’d we invite an unfinished dog into our home? 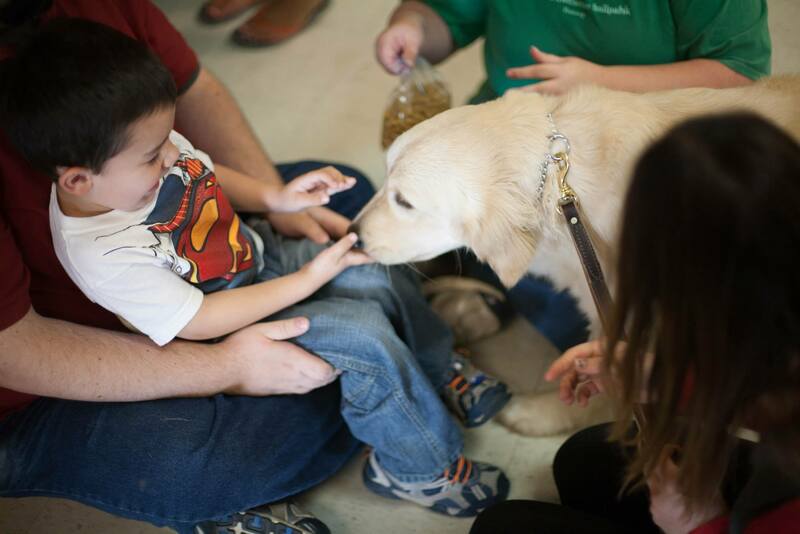 The hardest part of service dog relationships, especially for people on the autism spectrum, can be bonding. It is even harder when the human side of things is a young child. Young children are even more unpredictable than adults and it would be a lie to say J doesn’t have some behaviors that would take some getting used to, namely his volume. The younger we bring a dog into our home, the more normal this all will appear to the dog. They will grow up understanding J’s language as one of their first languages, something incredibly important for any dog but especially poodles who form their social understandings early and solidify them. The noise of our neighborhood, the number of people, the sirens from the police station and fire station, the weird noises the wind makes against our old windows, J’s sounds and randomness… A young dog would grow up with this beside their boy and it would be a part of the air they breathe, just part of their day to day life. An older dog might have to work hard to grow used to a lot of this and runs the risk of never fully acclimating. The dog will go through full training and eventually go through a class and graduation with us just as other organizations do, the upbringing will just be done in the most advantageous way for a full, life long and happy match. The best way to explain it is we’ll be the puppy raisers or foster family, APAW will be the trainers. Note that there is nothing wrong with receiving a 2+ year old dog as a service dog. In fact, most organizations place in this age range, especially for guide work or mobility work. These dogs work magnificently for their partners and it is a method that clearly works for a lot of people, it just is not the most likely for success in a case like J’s. What is the timeline for J’s new dog? This is fluid right now. Frustrating answer, right? Yet, somehow, it does not feel that way here for us. The placement of a dog in our home, be they on their training journey already or just starting out, all depends on availability and suitability. They are aware of what we need. Now, it is a matter of whether or not there is a dog started on their training or if we await the next litter(s) of puppies and see if one of them is a decent match. Yes, you can tell early on if a puppy is likely to have a service career. It involves being a subject matter expert who spends long hours working with their litters getting to know how they behave, but over years and experience it becomes something known instinctively. We are still working with dogs and children here and when working with those groups, there is no such thing as complete and utter certainty. Things can go awry and APAW is by our side to work with us just in case that eventuality comes to pass. They know the hurt we’ve already suffered. They are eager to see that hurt not happen again for us yet we are all aware of the inevitable risks. Personal hope? I hope that J’s new dog is able to join our home in the early part of 2016. That is a hope, not a definite. We’re in the waiting now and that’s where volunteering we hope will come in. As volunteers we can get to know APAW better plus do something positive with our wait, however long it may be. If there’s any other questions, I am always happy to do my best to answer. It is with great pleasure that I get to share this now! Our new partners in the journey to reach a service dog for J-Bear is American Poodles at Work (APAW). They are located in central MA, so none too far from us, and are a small organization focused on their strengths. They work primarily with people who require mobility assistance dogs, psychiatric service dogs and a handful of autism service dogs. The placement of dogs from APAW stays within a 200 mile radius from their home base so they can be involved with their clients, something else we deeply appreciate. But, you might ask… why poodles? J-Bear currently shuts down when faced with a golden retriever, one of the most common dogs used for service work. Labradors he is open to, but they can still skirt the line of his ability to bond. When I saw APAW and realized there was zero chance of him receiving a dog who by appearances alone he would struggle to bond with, I was intrigued. Poodles are natural people pleasers and when raised with good socialization lead long, happy working lives. We met a half-dozen APAW dogs several weeks ago and had the opportunity to see these dogs shine doing what it was they love. The elder statesman of the group, Charlie, really blew me away. Here he is showing off his stuff in Dogs 101’s episode on the poodle: http://www.animalplanet.com/tv-shows/dogs-101/videos/poodle/ – He is the big cream boy showing off on the white background and in various other bits of the segment. There are other selling points, such as poodles being low allergy dogs due to having hair rather than fur and the fact that they as a breed are generally very sturdy in terms of their health and known breed issues. They have a long, active life… Something that coupled with a loving, caring home will give J-Bear a partner for many years to come. He needs this certainty and comfort. We need the ongoing, positive and friendly support of a great organization. APAW has stepped up and we are so, so looking forward to seeing what the next year brings with it. We are uncertain as to timeline in terms of when J will meet a new partner but as things progress I will of course update. We’re hoping for the first half of 2016 but we’re working with dogs here, which means anything can happen. Those playing along at home have known how terrible the past six or so months have been for our family. It just felt like bad news at every turn, from being separated from Brooklyn to having her torn from us completely and so many other little things along the way. 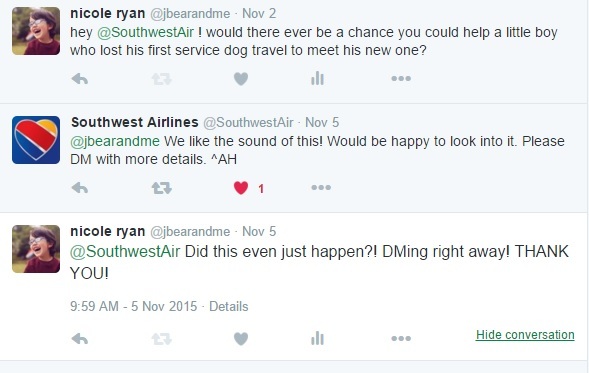 One day on a lark, I tweeted Southwest Airlines. We needed help if we were going to get to Ohio. I never thought they would respond. Then, shock of shocks, they did! It’s an understatement to say I was blown away. Someone took the time to just reach out to us. It was the first time that someone outside our community seemed to be listening. It was the first time that it looked like something good might begin to happen. It gave me the strength to go out in search of our new journey, a journey that will begin so much closer to home and without the baggage from before. Ultimately, we do not need the assistance anymore. 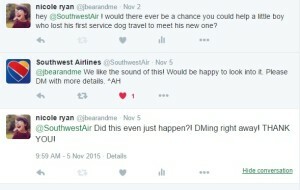 I had a wonderful exchange with Southwest over private messages and I learned how to get other non-profits in touch with them over needs they might have for travel as well as saw that compassion truly is a core value of theirs. They likely receive thousands of tweets in the course of a day, more when there’s foul weather and reason for anger. No one had to reach out to me and yet, people did. They did so with care and kindness. Thank you for showing us LUV, Southwest. I hope that someday soon we can plan a real vacation with J’s new partner and come travel with you all! I am having some anger issues tonight. Something has me ready to spit nails so unlike those who hurt us this year, I am going to do something helpful. There are a lot of new service dog teams out there who might need this, so here goes. Diapers: Yes, you read that correctly. Grab a few diapers, preferably larger than small baby sizes, and have them on the go in your bag. You can clean up a wet mess in no time flat with one of these suckers! Open, throw down, wipe up. Fold the diaper up, throw away. Alternately if diapers aren’t easily had, feminine pads can do in a pinch. Diapers just absorb more! A folded flat cereal box: This one was recommended by a trainer. They suggested having it ready for if you see dog about to squat for an accident, but that is not always possible. If you do have time to get it out before your dog fully squats you slide it under their rear and let the accident happen there. This was never quite possible for us, accidents occurred too fast. Clorox Wipes: You can usually buy these (or Wet Ones) in travel packages for throwing in your bag and having to wipe an area down quickly after you clean up the mess. It’s your responsibility as the handler to make sure the area is the same when you leave as when you arrive, these go a long way towards that goal! Baggies: You can use large ziploc bags, old plastic shopping bags, or in a pinch dog waste bags to pack up the mess and dispose of it quickly. Hand Sanitizer: Until you can get to soap and water, tide yourself over with trusty old hand sanitizer. If for some reason you cannot clean up or you can only partially clean up the mess, direct staff to the area and offer apologies. They cannot clean up without knowing what’s happened and most are quite understanding. This is most likely to come up with your child is having a hard time with the situation or your dog is actively ill and you need them to get outdoors before the mess gets worse. Never just leave a mess. Your responsibilities as a handler dictate that you make sure that you never leave such a thing behind without at least trying to help. The most courteous place to dispose of the offending items is obviously outside but sometimes circumstances make this tricky. I found finding a restroom made this easiest as they usually have a bin for sanitary waste. It also allowed a moment for hand washing! Usually, though… Your best bet is to drop it outdoors in the first available bin. It is also important to remember to not scold your dog. It’s going to do exactly zero good for either of you to do so. Make it a non-thing as much as possible. You clean up, you carry on – preferably stepping outside at the very soonest moment to make sure that if anything else needs doing it can be done somewhere appropriate. It may be sad and shocking when accidents happen but it’s no more fun for them than it is for yourself. Do your best to remain calm, clean up and move on. Believe it or not, most stores have seen worse at some point in their existence. Hopefully this can help some of my friends who have newly graduated or who are just about to meet their new family member. Good luck out there and remember accidents happen, it’s only when they happen regularly that you have to worry! This year, particularly the past several months, have been a complicated dance for J. He has taken steps backward that have at times overwhelmed us, then taken steps forward that are major victories what feels like moments later. The pattern has been there his whole life. It is currently amplified by loss and recovery from said loss, but it is the existing pattern that is how J grows. The gains make that clear, but the steps backward are sometimes quite scary to witness. When J was 2, his main method of play was not play as most would recognize it in children. He lined up his toys across the room, sometimes attempting to do so across the entire apartment. There were trains, cars, whatever was around just got lined up. You did not mess with the lines. Lines were love, lines were good… We left them alone, and we let him find his peace and order in them. It took him a lot of time, encouragement and work to learn that letting lines go was okay. He could return to them whenever he needed their comfort, but they did not have to exist all the time. He built his confidence and his skills and slowly, lines were no longer a major part of our lives. The lines have returned. They creep in slowly, created with boxes or trains with an odd other toy or two thrown in. There is no moving these lines without his involvement. The fearful rigidity is not there but the anxiety is still palpable. Now, they involve elaborate scenes invented in his own mine integrating beloved cartoons and songs, but the main purpose is the same: comfort and predictability. The first time I noticed their return I have to admit I was sad. It is easy to take something that seems a deeper sign of regression as bad news. The longer I watch and listen, allowing him to show me what he is doing the more things are falling into place. I have to understand the framework for the behavior. This isn’t a loss of hard-fought skills but a return to a safe place, when life was different and there was no heartache. This is like him bringing out Miss Kitty or any other stuffie… it is just behavior rather than items. He uses these behaviors as a safe place; a sanctuary in which he can recover his peace. When that peace is felt, he is able to reach out and work on new skills, new adventures and new strengths. He has learned to read not one but two words, “go” and “stop”. When at home, he is stringing more and more words together with increasing confidence. We are able to sometimes even work on simple abstracts like what we feel occasionally which is huge for a little boy who is very, very concrete in his thinking. It has always been firmly believed by all of us that he knows more than he imparts easily to most people. This all reinforces this belief. The full comprehension of what has happened may not be there, but he understands enough of how he feels about it to cope. He understands that this half of the year has been a lot of change and some of it quite upsetting and scary, yet he sought out a way to cope and created his own calm. It is not always a lasting peace and we have a lot still to work on to help him make it last, but it is a start. He, with the help of the world that surrounds him, is laying a strong foundation on which to build up from in the year(s) to come. He is taking that which was taught to him in his earliest days and applying it. It’s a wonder to behold and I feel very, very lucky to be a part of his winding, crazy adventure as it unfolds. Yes, our hearts were sorely and unfairly broken but most of all his sweet, determined spirit remains intact. I am so, so proud of my boy. I wanted to make a brief post to clarify a few things to those who have given donations over the past 6-9 months. A travel fundraiser that is now “Dog To Be’s Needs” fundraiser so that the funds will still be focused on supporting J’s new partner. Monies are kept in a separate account when we have fundraised like this. We paid vet bills, paid to bring Brooklyn back to OH (god that hurt to type) and now have a modest amount tucked away that will cover year one of dog to be’s insurance. So, the big question is, what happened to the $13,000 we initially fundraised to receive Brooklyn? We agreed with 4 Paws that it was best for both sides if we parted ways. This was agreed to with the understanding that the fundamental focus of the agreement in this unique situation would be J receiving a partner. That partner will not come from 4 Paws but from another organization, so the amount whatever non-profit we work with requires for an autism service dog under $13,000 follow J-Bear into the new partnership. It will be an exact amount that is transferred from one organization to the other. We will never touch that money, which is in keeping with the spirit in which we fundraised. This means the donations for that long, large campaign still benefit the same cause which people donated to support: Service dogs for people with disabilities in J-Bear’s name, allowing him to receive a partner. I believe in transparency. I believe in strong communication. I do not want anyone feeling stiffed, feeling misled… I want everyone to understand the situation clearly, hence this second post in one day. As always if you have any questions or concerns you can message me on Facebook or email me at galebird(at)gmail.com. Thank you all again for your support and understanding. We began a journey in April of 2013 that we thought would bring J-Bear a long-term partner and friend as he grew up on the autism spectrum. We met beautiful Brooklyn in October of 2014 and fell madly in love with her. She was in so many regards exactly what we needed. It’s hard not to say ALL regards because the one regard in which she was not, she could not help. She needed help to mend it. And we lost her. We’ll never understand how or why but now, she is placed with others. This week, we formally ended our relationship with 4 Paws for Ability. We are instead pursuing a partnership with a local agency that will allow us deeper involvement and nearby support as we find a new partner for J. I am hoping to have everything perfectly final soon so I can share even more details but suffice to say, we are incredibly excited. It has been agreed that the funding raised in J’s name for Brookie will follow him to allow him a new partner at a new organization. The money fundraised for the trip we would have had to take to Ohio in 2016 is still set aside. It will still be used for J’s new partner exactly the way we noted in the fundraiser itself: All money not used for travel will cover vet bills, insurance and dog needs. We no longer need a lot to get us going and what has already been donated will cover a year of insurance for Dog to Be. Given the powerful lesson we learned about insuring our dog via Brooklyn’s health scares, we’re relieved that this will be easily covered. The community we have met online via 4 Paws, Ride to Give and everyone else who has stopped by to read this blog and our page have been a surprising wealth of warm, caring support during some very painful, traumatic months for our family. We have been hurt in a way that cannot be seen yet pain etches so many of our current experiences. This past Tuesday, we got a glimpse of life after the pain. We are eager to reach it. We are hungry to begin anew. We are excited to share this journey with all of you. Thank you, all of you, for your love, care and support of one sweet little boy and the golden girl he misses each day and each night. She will be in our hearts forever and will always have a door open to her if she needs it, no matter what. His new partner will not replace her. They will be a new friend, a new family member and a new journey. Since J was so brave in seeing Santa this year, of his own accord and out of the clear sunny blue I might add, I figure Santa is the guy to direct this vaguely tongue-in-cheek letter to. Keep in mind that no family involved with 4 Paws for Ability gets to choose their dog. That’s never how it works. You give them as much license as possible to choose the match and as many details as possible to make the match work. So I am asking for a little magic. Here is what we’re hoping for in a dog. I am hoping you can pull strings and find this perfect pup for him. Easy going: We live in a busy town on a busy corner with lots of random happenings. Fire engines, police cars, random pedestrians, crazy trucks, random animals… You name it, we have it. It’s not a terrible place to live but it is definitely a shock to the system to a creature that may be more well suited to peace and quiet. His pup needs to roll with the random of our environment like the rest of us do, right down to not getting crazy if they spy the cat upstairs being her weird but sweet self. Loving: Oh, the heart his pup should have. They should be doting enough to keep tabs on him yet wise enough to understand that sometimes the best action to take is to simply be. His girl knew this. If he was struggling but wasn’t ready to reach out for her yet, she laid nearby. If he was starting to key up and the people around him hadn’t noticed, the signs were read and she knew where to be to help him undamage his calm. His partner should be nurturing without being overwhelming; loving and wise yet resilient enough to know that sometimes, all they need to do is just be there in his sphere without expectations. A little playful/silly: This household is lost without laughter. A little tinge of mischief reminds us on the bad days exactly why we keep moving forward. A slightly silly, impish streak is enough to keep us on our toes and remind us that we have not one, but two silly monkeys in the house, something we miss so much right now. It keeps J delighted to see his antics engaged in and those are moments of great beauty to witness. Strong: J is a growing boy, taller every day it feels like. He is so, so gentle and considerate of animals and younger children but he can be a stumbling clod, too. He is going to nudge tails or paws at some point and though it will be rare, he needs a partner who will understand (with our loving help!) that it was an oops and not a regular thing. He needs a strong partner that can handle tethering without being phased, especially since J loves it when his dog walks a little ahead of him and makes tension on the leash. I don’t care for when he does that either pup, so we’ll work on getting him to walk close together just as we did with Brookie. Patient: J has a thing, you see. He loves noses, ears and tails. He is not, for anything, rough. It was his gentleness with his girl that blew us away given his clumsy nature with the adults in his world. He does love to touch noses, tails and ears the best though. This requires patience on the dog’s part and hopefully the ability to learn that this is a language J uses for comfort and companionship. There is no yanking, no pulling, no harm… Light touches and pets are his modus operandi. A learned avoidance of stuffed animals: Oh, pup. This one will be hard but if you do not know not to touch the stuffies already we are going to work on this together. Stuffies are J’s friends. They mean an intense amount to him, each and every one. He relies on them to get him through the hard times while we await you and still will be protective of them when you get here, so we need to be sure we can succeed in this mission of Leave Stuffies Alone ™. No golden retrievers: It doesn’t matter how much goldens have won over the adult’s hearts… J shuts down when faced with one now. They do not respond exactly like Brooklyn because they are not her. For his sake, please, do not bring another pure golden baby into our lives only to see the team fail because it could not even begin to forge a relationship. Give him anything else, any other breed sturdy enough to do the job just please not another golden. Santa, we just want our hearts to be full again. All of us. We don’t want any more days of only getting glimpses of J lighting up rooms with his smiles, charm and laughter. These are things that used to be the norm and not the exception. Please, he’s been so good and tried so hard, I hope you can help. Two years ago this past August we had the pleasure of meeting Laura of Family Tree Photography for the first time. She has become a tremendous friend and support as we have watched both of our boys go through the highs and lows of starting out lives with service dogs of their own. You might remember the wonderful beach photos at the top of the blog, featured in this post, and now we have some new pictures to show how much J has grown. I was sad to do these without his partner by his side but there was nothing I could do. Thankfully, Laura is gifted with children of all abilities and brought out his best even when he didn’t want to give it at first. So, without further adieu, here are the results of her amazing work! I could not be happier!